If you weren’t fortunate enough to attend the Goodwood Revival yesterday you missed the the first public debut of the Ford Mustang in right hand drive form. In the 50 years of the cars history over 9 million mustangs have sold almost all exclusively within America and all in left hand drive. 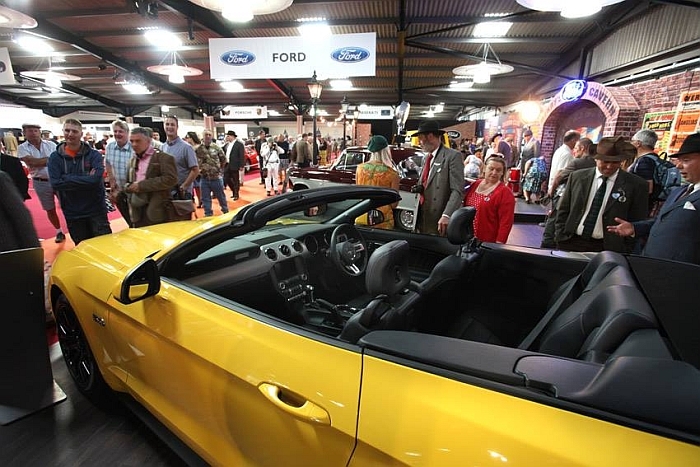 The convertible RHD Ford Mustang was displayed the homage to the the Earls Court Motor Show Ford stand at the Goodwood Revival. It may have taken half a century but the Ford Mustang has finally made it to Europe. The steering wheel is now available on the right hand side of the dashboard; but it’s not just the steering wheel placement that’s changed. The solid rear axle is gone in favour of fully independent rear suspension. The Mustang is available in the UK as both a fastback (American for Coupe) and a convertible model. British drivers will have a choice of two engines. A 2.3 litre turbocharged EcoBoost engine that delivers incredible performance and economy. For those that want the full blooded Ford Mustang experience a 5.0 litre V8 is also available with the characteristic V8 engine note and blistering performance to match. The EcoBoost Mustang will be available from under £30,000 and the V8 Mustang could be yours for just under £34,000. Of course there was a myriad of other Fords on display from Escorts and Ecolines to Ford GT40s and everything in between; you can see a gallery of a few of these vehicles on our Facebook page. ← Don’t Judge a Book by its Cover – The all-new (really) Fiat 500 – If it ain’t broke why fix it?